This is three Outside Sudoku puzzles (Rules of Sudoku Outside) for your own benefit. I must confess that they are ones of my favourite Sudoku's savour. If you like the Outside Sudoku puzzle I have a freat news for you, you could find plenty of them in Outside Sudoku Challenge 1. The puzzles in this book are going to delight you. This is two Outside Sudoku puzzles (Rules of Sudoku Outside) for your own benefit. Lets me do some promotions. Dont remember that if you like these puzzles ( I understand you !) you could find plenty of them in Outside Sudoku Challenge 1. Everebody that likes Outside Sudoku should buy this book, this is a concentrate of pure happiness. This is two Outside Sudoku puzzles (Rules of Sudoku Outside). Here the cold temperature is coming so I beleive that nothing is more pleasant that to stay in warm place doing puzzle. I hope these two puzzles will enjoyed you. Nobody could reproach me for not taking care of you with these two Outside Sudoku puzzles. 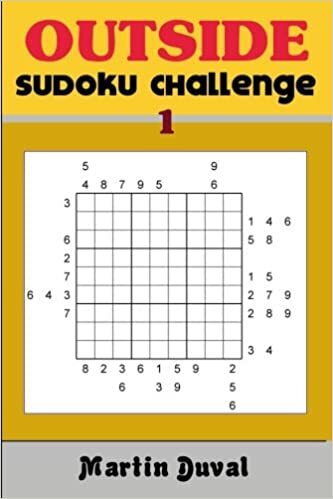 The Outside Sudoku puzzle is perfect for the tenacious solver, because it required a lot of reflection and determination. I know that you have these qualities. So this is the puzzles. And finaly the last one. I want to inform you that if ever you have any comments about this site, or about anny puzzles published in this site (or not). Please don't be shy.